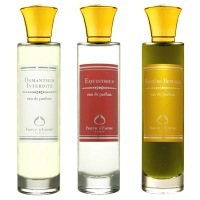 Parfum d'Empire will launch a new trio of fragrances in September: Osmanthus Interdite, Fougère Bengale and Equistrius. Osmanthus Interdite takes the Chinese empire as its inspiration, and the fruity floral features notes of green tea, osmanthus, rose, jasmine, musk and leather. Fougère Bengale takes us to a "veritable tiger hunt in Queen Victoria's India", with notes of mint, moss, hay, gingerbread, tonka bean, tobacco, patchouli and lavender. Equistrius is named for a racehorse owned by Marc Antoine Corticchiato, the founder of Parfum d'Empire. The woody amber scent pays tribute to the Roman Empire with notes of iris, ambrette butter, sandalwood, vetiver and chocolate. Update: see a review of Parfum d'Empire Osmanthus Interdite. Just looking at the bottle of Fougere Bengale, I find that I want this very, very much, and of course if it smells like it sounds (tobacco, oakmoss, tonka bean? Yum!) then that's even better. And the notes for Equestrius make it sound equally desirable. Any idea where these are going to be available, and for how much? The price is listed at Osmoz at €92, and the line is pretty well distributed in the US: Aedes, Beautyhabit, Luckyscent, Your-Cosmetics. Oh, I SO want that Equistrius juice, yet I SO want the Fougere for the bottle! I love the Parfum d'Empire bottles, and Cuir Ottoman was my ultimate fragrance find last year. Oh my….I'm having a definite yen for the Osmanthus, too. But as an admirer of the Parfum d'Empire line overall (even though not all of the fragrances are wearable for me, they are all quite likeable), I'll be eagerly anticipating the chance to try all three of these. Really? But the bottles all look the same to me! It's something about the colour of the juice in conjunction with the colour of the label…I love the Ambre Russe and Eau de Gloire bottles (although neither of these thrill me in terms of smell). The Cuir Ottoman juice with its deep purple label, I find very satisfying. Oh dear. Now how did they get into my head and figure out just exactly what to tempt me with…? I was already excited just to hear they were expanding the line. Now I'll be biding my time and saving pennies until I can get a hold of some sample in September. I'm also going to try all of them, Osmanthus and Fougere Bengale look great (although the words 'tiger hunt' give me shivers). And I also love Cuir Ottoman. Parfum d'Empire needs to come out with a coffret set — all 3 in 15 ml, don't you think?